The starting price for these beauties has been reduced to $4,995.00. Hey, they even come with the original boot trees. 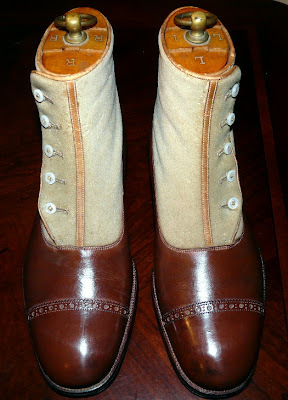 You've got 5 days and 7 hours to convince the wife that she needs a Birkin (or a few mortgage payments) much less than you need spatted Bespoke boots with 10 amazing little buttons. Beautiful, but a bit (OK, way) too steep. Even with the crap dollar, a new pair from Lobb shouldn't be THAT much more. Bespoke is only an advantage for one person. Chances are they'd be pretty uncomfortable, being made for someone else's irregularities. I'd bet Vogel could make a nearly identical (bespoke) pair for considerably less. Tony Gaziano used to run the bespoke department at Edward Green. Those are MAGNIFICENT! I'll add to my list of international favorites. Many thanks, QR!